Operator Jim Eklund in Stamford, NY. In background is the mobile slaughterhouse overseen by Local Infrastructure for Local Agriculture (LILA) an affiliate of Glynwood. Photo by Glynwood. The Hudson Valley is the epicenter of innovative ideas around food distribution and agriculture. New York City’s demand for sustainable food is driving much of that change as residents increasingly seek food from organic, small-scale farmers. Innovations like the modular and mobile slaughterhouse draw inspiration from the gaps in infrastructure for farmers in rural areas as well as the vast distances between rural farmers and food consumers. Experts say in a video that “mobile slaughterhouses are critical for the replacement of the degradation of infrastructure of rural communities.” Ultimately, though, cities are also dependent on food. And they can’t be sustainable without ways to access and bring food to residents. The new mobile slaughterhouse has the potential to support farmers, reduce distance traveled, rebuild the local food economy and repopulate the rural environment. The rise of industrial farming in the 1960s led to a concentration in the number of slaughterhouse facilities across the country, while the sheer number of farms diminished. The scale of slaughterhouses also grew. Today, as small independent producers struggle to meet the interest in local food from city dwellers, farmers face difficulty getting their animals to slaughterhouses and to markets. It is not uncommon for producers to schedule the processing of animals a year in advance, which is often difficult when raising free-range cattle. Also, in some cases, with the shortage of processing facilities, farmers can only bring one or two cattle at a time to the sites. Glynwood, a non-profit in the Hudson Valley, launched a new mobile slaughterhouse with a docking station in rural Delaware County, New York. The slaughterhouse is designed to serve multiple and smaller meat producers and will move around the Hudson Valley region, responding to demand from farmers. What that means is there’s a refrigerated unit, the cutting area, and other components that fit together and act as separate vehicles – if needed. The trailer also has a section for inedible products and waste, as well as an office for the USDA inspector, as required by the agency. Animals wait in a pen outside and are then brought inside the facility for slaughter. The slaughterhouse processes about 20 cattle per day – more for smaller animals – and is suitable for cattle, sheep and goats. A modern, massive industrial-sized slaughter facility processes around 1,700 cattle, which, in turn, increases the likelihood of contamination and disease. A new paradigm for rural-urban sustainability? The unit offers opportunity for sustainability but policies are needed to make projects like this easier to implement. Glynwood is currently working on setting up more docking sites in the region where the mobile slaughterhouses would locate. More locations, and eventually more slaughterhouses, mean that farmers don’t need to travel nearly as much to slaughter their animals. Some drive hundreds of miles to facilities and drop off their animals, head home, pick them up, take them to a butcher and then to the city. The concept of a mobile site for processing collapses these disparate components into one system. The challenge is to coordinate demand from the farmers, seasonal spikes in facility use, and scheduling. 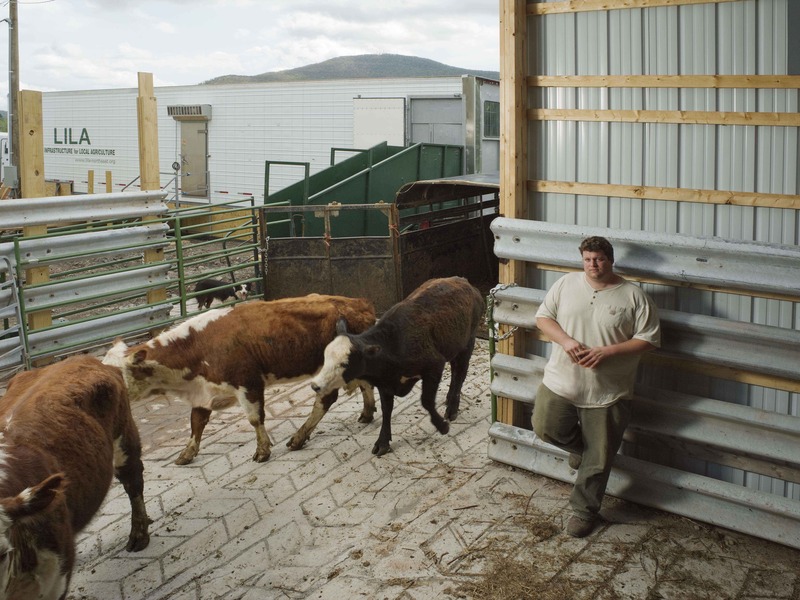 The slaughterhouses that currently exist in the American West travel from farm to farm – this one will stay put for a few weeks or even longer. The mobile slaughterhouse has the potential to redefine the relationship between urban and rural communities. Meat processing and sales could be brought right to the edge of the city, changing our concept of farmers and food. Glynwood is encouraging future sites of the mobile unit to host butchering and other forms of entrepreneurial food industry. They also hope businesses, as opposed to non-profits, will take up the model.